It came out of nothing. Releasing a new version of iPhone SDK last week (along with the reveal of the iPad) Apple lifted 3G VoIP restrictions on the iPhone. Since then VoIP calls are not only available over Wi-Fi but also over cellular networks. VoIP on the iPhone has been the source of many debates with companies such as Google being denied access to the platform and the FCC inquiring as to the restrictions in the Apple App Store. Apple didn’t want to allow the applications offering VoIP over 3G networks to operate on the iPhone platform. Everything changed last Wednesday. iCall was the first to announce that its iPhone and iPod touch app now supports VoIP over 3G and the app was available to download immediately. Confirmations of the great functionality of the iCall application came from various sources. "I applaud Apple’s decision! This heralds a new era for VoIP applications on mobile platforms,” said iCall CEO Arlo Gilbert. The next day both Fring and Acrobits added the ability to make calls over 3G to their iPhone applications. 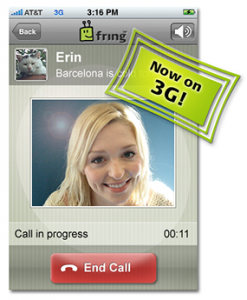 Fring quickly announced first free video calls over 3G, while Acrobits proudly announced that since its Push Notification service allows to receive calls when the softphone is closed, users can receive calls anywhere they have a 3G connection. Agito’s product is compatible with iPhone, iPod touch and some Blackberry and Nokia devices as well. Finally, yestarday, Media5 announced that its Media5-fone application for the iPhone/iPod touch is VoIP over 3G ready. The company has applied to Apple to activate the VoIP over 3G feature for the Media5-fone Lite Edition. The application is expected to be approved within 1-2 weeks. Other main VoIP developers still haven’t upgraded their iPhone apps.